Learn about the temperament and personality of the Norwich Terrier. Discover what he's like to live with, his traits and characteristics and how he generally behaves. 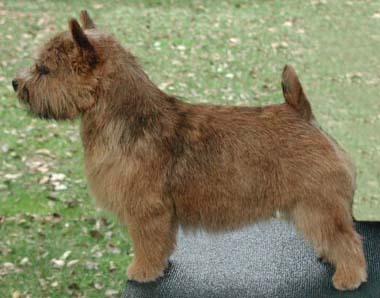 And look at lots of Norwich Terrier photos. Norwich Terriers have the terrier spirit without the quarrelsome nature. These tiny terriers are energetic, happy, feisty, wonderfully affectionate, remarkably intelligent, adaptable, fearless and loyal. They are people-oriented and want to be underfoot. They want to please you and are highly trainable. They are fast to housetrain. They enjoy earthdog, agility, and obedience work, but they are usually game for anything. They will look to their master to provide and enforce the house rules, or they will try to rule the roost. They can be independent minded, and will take after a squirrel or rabbit if given a chance. For this reason, they need to be kept on lead or in a fenced area. They like to escape out through open screen doors, and they are not car smart! They do well with other pets except for those they might see as prey: gerbils, birds, or mice. They are not yappy dogs, but they will bark to let you know that someone is at the door, or that someone is walking by. They love children, but young children need to be supervised around the Norwich. This is a small dog, and a toddler could accidentally hurt him. They have moderate exercise needs and enjoy a daily walk. They thrive on an active life. They will dig if they don't get enough exercise or attention. You probably won't be able to resist those irresistible pointy little ears, and will give this dog all the attention he craves. The Norwich Terrier is intelligent and quite easy to train. He learns new commands quickly at an above average rate. The Norwich Terrier sheds practically no hair at all. You'll virtually never find a hair in your home!